Physical assessment skills: A develop-ing dimension of clinical nursing practice. Most common foods causing allergies are milk, eggs,wheat, shellfish, peanuts, and chocolate. The provider clearly demonstrates her or hisrecognition of the husband’s intra- and interpersonal conflicts but uses interpersonal com-munication to help enhance their relationship and build trust. (2002) Rivastigmine for the treat-ment of dementia and visual hallucinations associated withParkinson’s disease: a case series. Because these cells are full of cAMPthey pose an immunosuppressive threat. Methicillin-resistant Staphylococcus aureus and Staphylococcuspseudintermedius in veterinary medicine. Vitamin D and calcium supplementation reduces cancer risk: Resultsof a randomized trial. Drafting is exacting. It has to be done properly. Usually, it has to be done quickly. But while the output has to be professional, much of the input, meaning many of the drafting entries related to the matter, are rote. Your company’s management wants completed deal documents. They certainly distinguish between the high value they place on your skill-intensive services—analysis, counseling, and negotiation—and the far lower value they place on what they see as administrative tasks. Your team is skilled and incisive and your forms work, but there’s little tolerance if others perceive archaic, inefficient processes that could be slowing them down and putting their business at risk. They don’t want document drafting. They want drafted documents. Today, a growing number of in-house lawyers are automating their time-draining drafting processes. They’re removing the inefficiencies of the past. They’re improving quality and responsiveness while shoring up the legal team’s contributions to their company’s growth and success. Legal document automation gives us the flexibility to respond to increasing workloads, it allows us to keep more work in-house and get matters resolved faster. It improves the communication and workflow between staff members, both within the department and outside of it. 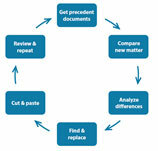 Legal document automation eliminates drudgery, helping attorneys work the way we want to work. We did not go to law school to format signature blocks or cut and paste the same hundred changes to a precedent document that we cut and pasted last week. If your team is ready to start automating time-draining drafting processes and remove inefficiencies, contact Leaflet to find out how you can put our new generation of Legal Document Automation to your advantage.